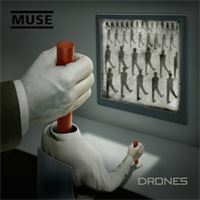 Drones will be released on 8 June 2015! From Matt: “To me, 'Drones' are metaphorical psychopaths which enable psychopathic behaviour with no recourse. The world is run by Drones utilizing Drones to turn us all into Drones. This album explores the journey of a human, from their abandonment and loss of hope, to their indoctrination by the system to be a human drone, to their eventual defection from their oppressors." The first single from Drones, “Dead Inside,” will debut the week of 23 March. Pre-order for the new album will be available tomorrow at 7:30pm GMT, along with the new song “Psycho” - click here. Muse's new album, Drones, will be released on 8 June 2015!